Today.Az - Baikonur's Kazakh staff transferred from "Proton" to "Baiterek"
Baikonur's Kazakh staff transferred from "Proton" to "Baiterek"
Kazakh specialists, who previously prepared "Proton" space rockets for launch at Baikonur cosmodrome, have been transferred to and are passing the re-training course at the facilities, which Russia hands over to Kazakhstan in the framework of the "Baiterek" project, a source at the cosmodrome told RIA Novosti. "Most of the Kazakh specialists who worked over the calculations for the preparation and launch of the Proton space rockets have been transferred to the accepted facilities, where they are engaged in the study of equipment and operational documentation and are already involved in the maintenance of equipment and devices," the source said. 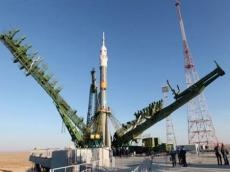 At the same time, the source said that Kazakhstan has already received the assembly and test building at the site of the 42nd cosmodrome, the launch complex at the site of the 45th cosmodrome and the auxiliary infrastructure. These facilities will be operated by Kazakh specialists. "The process of documenting the transfer continues, which will be completed by signing the relevant documents at the government level," the source added. The source said the agreement on the "Baiterek" program was concluded between Russia and Kazakhstan in 2004, and at the end of 2017, the changes were made to it, according to which the Soyuz-5 launch vehicle became the base missile for the project implementation, which will be re-named as "Sunkar" during launches from Baikonur.